Comfortable hotel Large comfortable room. Helpful concierge who organised our day tour of LA. All just a name and brand nothing outstanding. I think a USB port in the room is a must!! The security staff were happy to charge my phone in their office, but it was a waste of my time waiting when I should have been able to do it in my room. There wasn’t anything outstanding about this hotel. Nice accommodation to stay at. Close to airport. Restaurant in hotel was very nice. Good selection of food for morning buffet breakfast. Unique experience rich with history! Large rooms with comfy beds offered an enjoyable & relaxing stay. Great choice of onboard dining, also a multitude of dining choices only a short drive away. 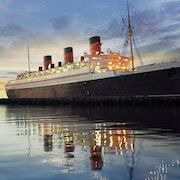 Fantastic opportunity to self-tour, or paid guided tours, to soak in the history of this magnificent cruise liner. Great time Fabulous location, first class experience! Staff were extremely helpful. Short walk on path to universal. Really enjoyed our stay here! 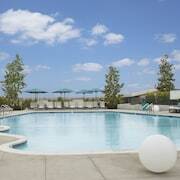 Looking for somewhere to stay in Los Angeles? Whether you're planning on a loved-up escape with bae, a break with the squad or hitting it solo (cos why not! ), you'll find a stack of mind-blowing hotel deals on lastminute.com.au. With a whopping 58 hotels within 2 kilometres of the centre, the biggest problem you'll have will be picking the right one. To chillax somewhere in the middle of it all, try out The Ritz-Carlton, Los Angeles and the JW Marriott Los Angeles L.A. LIVE. 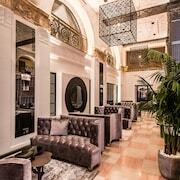 If they don't get you excited, The Standard Downtown LA and the Sheraton Grand Los Angeles are also nearby. 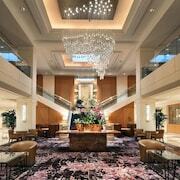 There are 2 available hotels in Little Tokyo, which is only 1 kilometre from the heart of town. 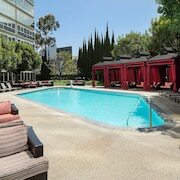 If you're down to stay here, try out the DoubleTree by Hilton Hotel Los Angeles Downtown and Miyako Hotel Los Angeles. Also take a squiz at Downtown Los Angeles, about 0.1 kilometres away from the middle. It's got 40 available options, such as the Omni Los Angeles Hotel at California Plaza and Hilton Checkers. Stopping by Universal Studios Hollywood® is a no-brainer! Can you even say you've been to Los Angeles if you don't mark it off? How'd you like to stay within wandering distance? 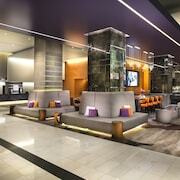 The Sheraton Universal Hotel and Hotel Amarano Burbank are where you should be. The Radisson at USC, Los Angeles and the Vagabond Inn Los Angeles-USC are close to the California Science Center. Convenient, right? Walt Disney Concert Hall, another great sight, is within a breezy stroll of The Los Angeles Athletic Club and The LA Hotel Downtown. 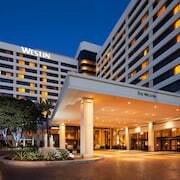 If the Microsoft Theater is on your must-see list, you may want to book in at The Westin Bonaventure Hotel and Suites, Los Angeles or the Sunshine Suites at 616 St. Paul. The Ace Hotel Downtown Los Angeles and the O Hotel also have beds ready for those who want to chill nearer to the Los Angeles Convention Center. You have the chance to learn all about what influenced the history of this part of the world at Japanese American National Museum. Millennium Biltmore Los Angeles and Best Western Plus Dragon Gate Inn are two good options if you and your mates are eager to stay close by. Long-time art lovers will be enthralled by the memorable exhibitions housed at Museum of Contemporary Art. You'll be able to check it out whenever, especially if you're crashing at the Metro Plaza Hotel and The Milner Hotel. Ever had to spend a night on the cold airport floor cos you got way too excited and forgot to book your hotel? Save yourself some stiff limbs and grab a room at the Embassy Suites Los Angeles Intl Airport North or the Embassy Suites Los Angeles Intl Airport South. Both are pretty close to Los Angeles International Airport, which is only 18 kilometres from the centre of town.